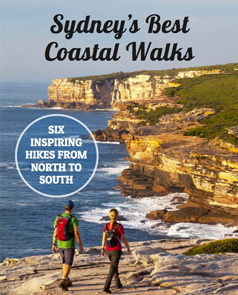 While multi-day inn-to-inn walks are more well-known in Europe (think Spain's increasingly popular Camino de Santiago), and thru-hiking in the USA is massive (think Appalachian Trail), Sydney's Great Coastal Walk is putting Australia on the world map for walking holidays. It's also called the Palm Beach to Cronulla walk and is nearly 200km of continuous coastal walking, combining all the best walks in Sydney. Stretching from Barrenjoey Lighthouse in the north, via the northern beaches to Manly on the Palm Beach to Manly walk. It follows the harbour foreshore, you walk over Sydney Harbour Bridge, through the city to the eastern suburbs on the Manly to Bondi walk. Then it continues all the way through the Bondi to Coogee walk to Cronulla and Royal National Park in the south. Sounds awesome doesn't it? You can walk it in either direction but to have the sun on your back (rather than in your face), it's best to hike Sydney's Great Coastal Walk north to south. It's easy to complete one or more sections as Sydney day walks. But, why not do all the Sydney coastal walks together as a walking holiday? This is the ideal timeframe to complete the best walks in Sydney as one walking holiday. There is no rest day, but you won't miss any of Sydney's best walks either. Day 3: North Head to Balmoral Beach. 18.5km / 11.5 miles, 6 hrs. Day 4: Balmoral Beach to The Rocks. 21.5km / 13.5 miles, 6.5 hrs. Day 5: The Rocks to Watsons Bay. 21km / 15.5 miles, 6 hrs. Day 6: Watsons Bay to Coogee. 18km / 8.5 miles, 3.5 hrs. Day 7: Coogee to La Perouse. 18km / 11 miles, 4.5 hrs. Day 8: Kurnell to Cronulla. 14.5km / 9 miles, 4.5 hrs. Day 9: Bundeena to Wattamolla. 14km / 8.5 miles, 7 hrs. Day 10: Wattamolla to Otford. 16km / 10 miles, 7 hrs. Start your great coastal walk by doing the Barrenjoey Lighthouse Walk loop. Sure, you're starting a ten day walk by walking up a hill that you have to walk back down again, but the view is well worth the short, steep climb. You also get a real sense of standing on Sydney's northern tip as you look across the Hawkesbury to the Central Coast. Here's more detail on the section between Mona Vale Beach and Narrabeen Beach. The rest of the day involves walking over a few smaller headlands on roads and tracks and walking some beaches and suburban streets to NRMA Sydney Lakeside Holiday Park (check availability). This is the longest day in distance but a lot of it is over long, flat stretches of sandy beaches. Walk in the wet sand at the water's edge where it's easier walking. If you take your shoes off remember to dry your feet thoroughly and remove all traces of sand. Even a couple of grains between your toes is enough to give you blisters. Finish your day with your first views of Sydney Harbour before a short walk to Q Station (check availability) for a night of luxury. A short stroll via Collins Beach (keep an eye out for Fairy Penguins) will bring you to Manly Wharf for the start of the Manly to Spit Bridge Walk, more often called Spit Bridge to Manly Walk or Manly Scenic Walkway. This is the first of three days walking Sydney Harbour on a mixture of bush tracks, elevated timber pathways and concrete walkway. Find yourself a nice AirBnB by Balmoral Beach for the night. Get your blood pumping with a few stairs to start the day and enjoy harbour and ocean views from Middle Head. Explore the military history on Middle, Georges and Chowder Heads before rounding Bradleys Head for city views to take your breath away. Continue past Taronga Zoo (you can catch a ferry to The Rocks if you want to! ), exit Sydney Harbour National Park and walk suburban streets before walking across Sydney Harbour Bridge to The Rocks for a well earned rest. Check prices and availability for accommodation in The Rocks. Is there a better way to start a day in Sydney than walking around Circular Quay, past Sydney Opera House and through the Royal Botanic Gardens to Mrs Macquarie's Chair? Today isn't all walking harbour foreshore however. It's predominantly a suburban walk interspersed with waterside walkways to enter Sydney Harbour National Park again briefly at Nielsen Park before continuing through suburbia to Watsons Bay. Well, ‘suburban' may not be the kindest term for Australia's most expensive real estate but it's not coastal walking. Watsons Bay Hotel has a cold drink and a warm bed waiting for you. If you're going to catch sunrise at any time on your great Sydney coastal walk, this is a pretty good option. It's only a five minute walk to Gap Bluff and a 20 minute walk to Hornby Light. They're both on the Watsons Bay Walk loop that you'll be walking anyway and you'll see the sun rise over the ocean and Sydney come alive behind you. The reveal of Bondi Beach later in the day is pretty special before completing the Bondi to Coogee Coastal Walk to end your day. After yesterday's suburban day, you're spoiled with coastal sights today.Check prices and availability for accommodation at Coogee Beach. Today gives you your first taste of walking undeveloped coastline. With the exception of North Head, Sydney's eastern and northern coastlines are full of houses. South of Maroubra is less developed and the new Malabar Headland Walking Track is a good introduction to the pristine coastal cliffs of Kamay Botany Bay and Royal National Parks. It's not possible to walk around Botany Bay from La Perouse to Kurnell. Sydney Airport is in the way, amongst other shipping terminals. National Parks and Wildlife are reinstating the ferry between La Perouse and Kurnell and we'll let you know when it happens. In the meantime it's 2.5 hour public transport journey, involving at least two buses and a train. Check out Captain Cook's landing place and Kurnell Visitor Centre in Kamay Botany Bay National Park. This is the site of the first known interaction between Aboriginal people and Europeans on the east coast of Australia. Interactive displays interpret this significant event in Australian history. Walk around Cape Solander, one of the best whale watching places in Sydney before continuing along the cliff edge on the Cape Baily Track to catch sight of Cronulla. Finish you day with a beachwalk, walking the longest continuous stretch of golden sand in Sydney. Check prices and availability for accommodation in Cronulla. Catch a public ferry from Cronulla to Bundeena in the morning and include the walk to Jibbon Aboriginal Carvings. Enjoy city skyline views to the north and reflect on how far you've come. Continue walking along Sydney's most pristine stretch of coastline to Wattamolla for a swim. You'll need to pre arrange a shuttle bus transfer from Wattamolla to your Bundeena accommodation (your Bundeena B&B host might do this for you). There is a secluded beachside campground at North Era 7km further along the Bundeena to Otford Walk but it's a long day from Bundeena. You probably won't want to bring your camping gear just for one night, either. So stay in Bundeena and get picked up and dropped off at Wattamolla. Now it's getting emotional! Your last day walking Sydney's Great Coastal Walk and one of the best. If you like bushwalking, this is the icing on the cake. The second day on the Royal Coast Track is more up and down than the first day but hills mean views, especially on the coast. You also get to walk through some of NSW's last surviving coastal cabins. Say G'day on your way past, they're a friendly bunch. If time and tide (very important!) is on your side you might be able to visit Figure 8 Pools before the steep walk to the top of the escarpment at Otford Lookout. Obviously, with only five day you can't complete the entire Palm Beach to Cronulla walk. However with these shortcuts, five days is still enough time to walk some of Sydney's best harbour and coastal walks. Day 1: Barrenjoey to Narrabeen Lakes. 25km / 15.5 miles, 7.5 hours. Day 2: Narrabeen Lakes to Balmoral Beach, via Manly. 26km / 16 miles, 9 hours. Day 3: Balmoral Beach to The Rocks. 22km / 14 miles, 5.5 hours. Day 4: Watsons Bay to Coogee. 14km / 8.5 miles, 3.5 hours. Day 5: Cronulla return via Bundeena and Wedding Cake Rock. 26km / 16 miles, 7.5 hours. This is the same first day as the ten day itinerary so you start with the Barrenjoey Lighthouse Walk loop. Even on a shorter time-frame the views across the Hawkesbury to the Central Coast are well worth the short, steep climb. This itinerary doesn't include the North Head walk, near Manly. Although the view back along the harbour from Fairfax Lookout is breathtaking, it's not the most inspiring walk there and back and it's a similar view from South Head, near Watsons Bay. Instead, cut down Manly Corso from the ocean beach to the harbour beach and pick up the Manly to Spit Walk from the ferry wharf. Cross the bridge at The Spit and continue to Balmoral Beach to find yourself a nice AirBnB by for the night. Once again, the same day as the ten day itinerary. You can make this shorter by not doing the Middle Head walk, but the views out the heads are pretty special. You could also catch a ferry from Taronga Zoo to The Rocks a bit later, but you'd miss the walk over Sydney Harbour Bridge. There are some things you just can't miss and this is one of the best things to do in Sydney. Enjoy a night in The Rocks, Sydney's first European settlement. Check prices and availability for accommodation in The Rocks. Today's the day to save time; catch a bus from The Rocks to Watsons Bay in the morning. The southern side of the harbour isn't ringed by beautiful harbour walks like the northern side. Yes, you're missing the Rose Bay to Watsons Bay Walk but it's a lot of suburban street walking and with only five days, you can't see it all. Do the Watsons Bay Walk to South Head. It's a similar view down the harbour that you missed by skipping the North Head walk on Day 2. Follow the Federation Cliff Walk from Watsons Bay to Bondi, then on to Coogee via the Bondi to Coogee Walk. Have lunch in Coogee then catch public transport to Cronulla. It's a busy day with busses and trains to start and end your day but a walk in Royal National Park is an essential part of any Sydney coastal walk. Staying in Cronulla (check availability for Cronulla accommodation) gives you access to Royal National Park walks. Royal National Park's sandstone cliff walks are more pristine than Kurnell's, so they're included and Kurnell's aren't. Walk around Cronulla Esplanade before accessing Royal National Park by ferry from Cronulla to Bundeena. Due to limited time in this itinerary, we suggest walking the Royal Coast Track as far as Wedding Cake Rock, then turning around. But if you're super keen and have great walking fitness (which you should after the last five days! ), you could walk the entire Coast Track in one day to Otford. If you have two full weeks to complete the Palm Beach to Cronulla Walk, lucky you! You walk the same route as the ten day itinerary so you do all Sydney's best harbour and coastal walks. We've put in a couple of shorter days to enjoy a swim at the beach (it is Sydney after all), and a rest day. Well, it's not really a rest day, we recommend a Sydney city walk just so you don't seize up. Day 1: Barrenjoey to Bungan Beach. 20km / 12.5 miles, 6 hrs. Day 2: Bungan Beach to Manly. 20km / 12.5 miles, 5 hrs. Day 3: Manly to North Head. 10km / 6 miles, 3 hrs. Day 4: Manly to Balmoral Beach. 14.5km / 9 miles, 5 hrs. Day 5: Balmoral Beach to The Rocks. 21.5km / 13.5 miles, 6.5 hrs. Day 6: Sydney City Walk. 10km / 6 miles, 3 hrs. Day 7: The Rocks to Double Bay. 12km / 7.5 miles, 3 hrs. Day 8: Double Bay to Watsons Bay. 13km / 8 miles, 3 hrs. Day 9: Watsons Bay to Bondi. 8km / 5 miles, 3 hrs. Day 10: Bondi to Coogee. 6km / 4 miles, 2 hrs. Day 11: Coogee to La Perouse. 18km / 11 miles, 4.5 hrs. Day 12: Kurnell to Cronulla. 14.5km / 9 miles, 4.5 hrs. Day 13: Bundeena to Wattamolla. 14km / 8.5 miles, 7 hrs. Day 14: Wattamolla to Otford. 16km / 10 miles, 7 hrs. Break up the long northern beaches sections so you ease into your coastal walk a little better. It's still a long day, but by stopping at Bungan Beach you shave an hour or more off your afternoon. If you can't find an AirBnB at Bungan, you might have to take a short detour to the Metro Mirage Hotel at Newport. Check availability for Northern Beaches accommodation. Today is mostly beachwalk so it's fairly leisurely. Stop when you get to Manly and save the North Head walk for tomorrow. Enjoy a drink at Manly's many pubs and bars before staying the night. A few hotels – Novotel Manly Pacific (55 North Steyne, near the ferry) and The Sebel Manly Beach (8-13 South Steyne, near the ocean) – give way to holiday apartments, B&Bs and hostels. Why not stay at Q Station? (1 North Head Scenic Drive) for a couple of nights? Meticulously converted from the original Quarantine Station, and situated in Sydney Harbour National Park, it has harbour views, its own sandy beach, good food and a feeling of getting away from it all. Check Q Station availability and all Manly accommodation availability and prices. Take your time exploring North Head, Manly. There are some interesting old World War II era bunkers and gun emplacements dotted amongst the heathland. All of Sydney's coastline was covered in this scrub before European arrival, so it's look a window into Sydney's natural history. The view down the harbour from the old Quarantine Station Cemetery is breathtaking and the Chinese script headstones fascinating. You might even have time for a cemetery walking tour or you could just laze around Manly Beach… We absolutely recommend staying at Q Station tonight, check availability, if you didn't already stay there last night. If you're staying at Q Station, a short stroll via Collins Beach (keep an eye out for Fairy Penguins) will bring you to Manly Wharf for the start of the Manly to Spit Walk, more often called Spit to Manly Walk or Manly Scenic Walkway. If you're staying in Manly you'll already be close to here. It's the first day of your Sydney Harbour walks and although you're in and out of Sydney Harbour National Park, the bush walking tracks are well maintained and it's relatively easy walking. A slow steady climb to Dobroyd Head at 80m is your only real challenge. Walk across Spit Bridge and find yourself a nice AirBnB by Balmoral Beach for the night. Today is your longest day in distance and you start with stairs up to Middle Head. Remember, hills mean views, and the views on the Middle Head Walk are unrivalled. There's also plenty of military history on Middle, Georges and Chowder Heads to soak up before rounding Bradleys Head for city views to take your breath away. Continue past Taronga Zoo (you can catch a ferry to The Rocks if you want to! ), exit Sydney Harbour National Park and walk through lower north shore suburbia before walking over Sydney Harbour Bridge to The Rocks. Check prices and availability for accommodation in The Rocks. We love to walk Sydney streets almost as much as we love nature walks in Sydney. Well, not nearly as much really, so we mapped a Sydney City Walk that links the many nature walks Sydney has to offer. We like it. It's a Sydney walking tour that ticks off all the city highlights joined by the city's green spaces. The best of both worlds really. You'll walk around the Royal Botanic Gardens to Mrs Macquarie's Chair tomorrow morning, so you could cut up Macquarie Street from Circular Quay to Hyde Park to see some of Sydney's oldest buildings instead. Although, the best view of Sydney Opera House and the harbour bridge is from Mrs Macquaries Point, and it's one of the best walks around Sydney harbour too, so you could just do it twice. Whatever you chose to do yesterday, this morning's walk is still one of the best walks in Sydney. Pass the Opera House, walk through the Royal Botanic Gardens to Mrs Macquarie's Chair and soak up Sydney in all its glory. Take your time, you only have 12kms (7.5 miles) to walk today. Continue along Woolloomooloo Bay past the Finger Wharf and the homes of Russell Crowe and John Laws (famous Sydney radio personality) to cut through the back of Kings Cross to Double Bay. Check prices and availability for accommodation in Double Bay. You might like to start you day walking the loop around Point Piper to see Australia's most expensive real estate or go straight to Rose Bay to pick up the Rose Bay to Watsons Bay Walk. After Rose Bay you climb Heartbreak Hill, made famous (or is that infamous?) by the City to Surf fun run before walking back down to the harbour to pick up the Hermitage Foreshore Walk around to Nielsen Park, Vaucluse. You're briefly in Sydney Harbour National Park again before cutting through suburban streets to Watsons Bay. Watsons Bay Hotel has a cold drink and a warm bed waiting for you. Relax, do the Watsons Bay Walk in the morning. You have a couple of half day walks to experience Watsons Bay, Bondi Beach and Coogee Beach in all their relaxed glory. If you haven't had your cossies out since Balmoral, now's the time. Camp Cove is a delightful place to swim, and one of our favourite Sydney Harbour swimming beaches. If you didn't pack your cossies at all, you might prefer Lady Jane Beach a bit further along the South Head Heritage Trail, one of Sydney's official “clothing optional” beaches. Enjoy the views from Hornby Lighthouse and Gap Bluff, before following the Federation Cliff Walk to Bondi. Check prices and availability for accommodation at Bondi Beach. Aaaahhh, Bondi. So much to love! Go for a morning swim before heading up Hall Street, which runs perpendicular to Campbell Parade, to Bills Cafe for their world-renowned ricotta hotcakes. You're only walking the 6km (4 mile) Bondi to Coogee Coastal Walk today so take your time. You have a couple of longer days coming up so relax and enjoy a barefoot beachwalk either side of a swim. Check prices and availability for accommodation at Coogee Beach. These Sydney coastal walks seem to continue forever… Coogee to Maroubra, then the new Malabar Headland Walking Track around to Malabar Beach. Follow the cliff walk through a number of golf courses into Kamay Botany Bay National Park where the track ends… What? The track ends? Well, it's not possible to walk around Botany Bay from La Perouse to Kurnell. Sydney Airport is in the way, amongst some shipping terminals. National Parks and Wildlife are reinstating the ferry between La Perouse and Kurnell and we'll let you know when it happens. In the meantime you have plenty of time for the 2.5 hour public transport journey, involving at least two buses and a train, to Kurnell. Silver Beach Tourist Park has cabin accommodation or look on AirBnB. Captain Cook's landing place and Kurnell Visitor Centre in Kamay Botany Bay National Park are worth a look. Recently NPWS have tried to make this site, the first known interaction between Aboriginal people and Europeans on the east coast of Australia, more understanding to the Aboriginal experience. Walk around Cape Solander, one of the best whale watching places in Sydney along the cliff walk and Cape Baily Track to catch sight of Cronulla. Finish you day with a beachwalk, walking the longest continuous stretch of golden sand in Sydney. End your day with a sunset walk around Cronulla Esplanade. Catch the ferry from Cronulla to Bundeena to access the final section of the walk in Royal National Park. If you plan on including the Jibbon Beach walk to Jibbon Aboriginal Carvings en route to Wattamolla, maybe skip Cronulla Esplanade. Either way you should be aiming to complete the Royal National Park Coastal Walk from Bundeena to Otford in two days, passing Wedding Cake Rock on day one. You'll need to pre arrange a shuttle bus transfer from Wattamolla to your Bundeena accommodation (your Bundeena B&B host might do this for you). There is a secluded beachfront campground at North Era 7km further along the Royal Coast Track but it's a long day from Bundeena. If you love hiking and camping, we highly recommend it. Your last day walking Sydney's Great Coastal Walk and one of the best. How do you feel? You might be footsore but you don't want to miss our favourite (well, my favourite – Ian) of all Sydney coastal walks. Curracurrang with its secret waterhole, Curracurrong and Eagle Rock with the cascades and waterfall into the ocean and the views from Garie North Head down the coast to Port Kembla in the far distance. It is unrivalled. Not just one of the best walks in Sydney, it is THE best walk in Sydney. You also walk through some of NSW's last surviving coastal cabins and if time and tide (very important!) is on your side you might be able to visit Figure 8 Pools too. It is an unbelievable way to end Sydney's Great Coastal Walk. As we said before, if you don't have time to complete these Sydney coastal walks together as one long walking holiday it's easy to complete one or more sections as Sydney day walks. Is it Safe to Walk Alone in Sydney? Tagged Bondi to Coogee, Northern Beaches Walks, Spit to Manly, Sydney Harbour National Park.